It’s not hard to love a Labrador retriever. Their outgoing, family friendly personality, great rapport with children, receptiveness to training, and their ability to hunt both waterfowl and upland game have made them a highly desirable and well-loved breed. This popularity is reflected by their place at the top of the American Kennel Club’s registration statistics for the past 24 consecutive years. When adopting or purchasing a new canine family member or hunting companion, we would all like to know that our enormous investments in love, time, and money will see a sizable return. For a family dog, we’d like to know that they will be healthy and live as long as possible. For a hunting or working dog, in addition to a long life, we’d also like to know they will be able to have a long, healthy career performing the specific task for which we’ve prepared them. Though we could never eliminate or predict all disease risks for our dogs, genetic testing technologies have made elimination and prediction of some inherited diseases easier than ever before. This blog is the first of a four part blog series examining preventable inherited diseases of America’s favorite dog, the Labrador retriever. What many prospective puppy buyers don’t realize is that some inherited diseases can be completely eliminated from blood lines by breeders through the use of genetic testing and informed selective breeding practices. In addition, if not already tested by your breeder, genetic testing your specific pick of the litter before taking him home can uncover potential disease concerns that may limit your dog’s health, happiness, or lifespan. The late-onset neurological disease, degenerative myelopathy (DM) is one such inherited disease that has unfortunately cut many dogs’ lives short. Similar to the disease in humans known as “Lou Gehrig’s Disease” (amyotrophic lateral sclerosis), the specific mutation responsible for causing DM is found in the SOD1 gene and has now been identified in over 100 breeds of dog. This suggests that the mutation is of ancient origin and probably arose in a common ancestor to the modern domestic dog breeds we have today. As dog breeds were created from these early ancestors, any genetic mutations they harbored became incorporated into the blood line of the specific breed being created. Though selective breeding efforts to reduce the incidence of certain diseases were occasionally effective prior to the invention of genetic testing, some diseases have characteristics which make them more difficult to reduce or eliminate through selective breeding alone. Due to its late age of onset, DM is one of these diseases. DM has a typical age of onset in affected dogs from 7 to 10 years of age. The first clinical signs of DM often noticed by owners are related to non-painful weakness in the hind limbs. Affected dogs will have difficulty getting up after laying down and have a general loss of balance and neurological function in the hind limbs resulting in an abnormal gait and dragging of the hind feet. After the onset of clinical signs, the weakness witnessed in the hind limbs gradually expands to incorporate the front limbs. In late stages, dogs can lose bladder and bowel control and will eventually be unable to walk. The progression from the first clinical signs to end stage disease typically occurs over a 6 month to 2 year period. There is no cure for DM and treatments are palliative at best. Unfortunately, the late-onset of this disease has made it very difficult to eliminate through selective breeding alone. Since dogs inheriting the mutation responsible for causing disease do not show signs until late in their life, these dogs are often bred prior to the knowledge that they have a disease. In addition, in my clinical experience, I found that many people do not recognize DM as a progressive neurological disease, but instead, often attribute the signs to arthritis, hip dysplasia, or a general sign of old age. Since dog owners rarely suspect an inherited condition in their older dog and may not feel compelled to notify their breeder, breeders that do not perform genetic testing are sometimes completely unaware that the dogs they have produced are carrying this genetic time bomb. In one study of 475 Labradors, 4% were non-symptomatic carriers of the mutation and 4.8% were at-risk of developing disease due to the inheritance of two copies of the mutation (See the “How Are These Diseases Inherited?” section below). Unlike the late-onset of DM, the onset of the muscular disease known as centronuclear myopathy (CNM) typically occurs in young Labradors between 6 weeks and 7 months of age. Similar to DM, CNM is a disease that will greatly affect a dog’s ability to work or perform physical tasks. Affected dogs typically display an intolerance to exercise, a hopping gait, decreased reflexes, generalized skeletal muscle weakness and atrophy, and an increased likelihood of collapse when in cold temperatures. Many affected dogs also develop a loss of muscle contraction in the esophagus (megaesophagus) resulting in difficulties swallowing. Problems with swallowing can allow food particles and other material to enter the lungs, thus, leading to severe pulmonary infections known as aspiration pneumonia. CNM tends to progress in severity until stabilizing at around 1 year of age. However, affected dogs do not improve and will continue to have problems often requiring medical intervention throughout their life, especially in relation to respiratory disease. Dogs obtaining medical interventions when necessary can have a normal lifespan despite their abnormal physical status. However, there is currently no cure or effective treatment for CNM. In one study of 1,757 Labradors from the US, UK, Canada, Ireland, and continental Europe, 13.9% were found to be non-symptomatic carriers of the PTPLA gene mutation responsible for causing this disease (See the “How Are These Diseases Inherited?” section below). How Are These Diseases Inherited? 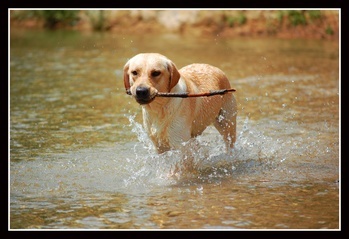 Many Lab breeders do not screen for DM as they feel in is foreign to the gene pool. Realization that breeds that are known to express DM, such as the Chesapeake Bay Retriever, and also are known to have been outcrossed into the Lab's gene pool should warrant enough need to test for it. Combine that with known studies such as the one mentioned above, and that should be enough gor any responsible breeder to feel the needbto screen for DM.